From Cave Junction, follow the Oregon Caves Highway 46 for 20 miles to where it ends in the parking lot of Oregon Caves National Monument. As you enter the lower end of the main parking lot look to the left for a one lane, paved road. This is USFS Road 090. Note to people in longer vehicles – it may be easier to go into the parking lot and turn around to get on to this road. Once on USFS Road 090, the pavement ends in about 300 feet and becomes a gravel surfaced road that climbs steeply for about half a mile. Follow this road for three miles to the intersection with USFS Road 070. Turn right (an almost 180 degree turn) and follow USFS Road 070 for about half a mile to a fork in the road. Turn right (*vehicles towing horse trailers see note below) and follow this road for about a half mile to where it ends at the parking for the trailhead. Note that the final half mile of road has three cuts made in the road surface for water diversion, which can make it difficult for low clearance cars to pass. If these cuts are an obstacle for your vehicle, park near the intersection and walk on this fairly level road to the trailhead. *Advisory to horse owners towing a trailer – there is no room for a vehicle and trailer to turn around at the Bigelow Lakes trailhead parking area. The parking area for vehicles towing horse trailers is to the left of this intersection, an area called Pepper Camp, which has adequate room for turning around and parking vehicles pulling trailers. From the parking area at the trailhead, the route follows an abandoned road for about a quarter mile before arriving at the foot trail that climbs toward Mt Elijah. Watch for the trail on the left after passing a large meadow above the road. The trail is listed on maps as the Lake Mountain Trail and is well designed and evenly graded through a forest of western hemlock and fir trees with sections that go through meadows overlooking the Bigelow Lakes basin, a small glacial cirque. The trail climbs to a saddle where there are two trail intersections on the left. One is a shortcut to the Boundary Trail that takes you in the direction of Grayback Peak. The other drops down and eventually connects to the Boundary Trail that takes you in the direction of the Red Buttes Wilderness. The Bigelow Lakes Loop Trail continues along the ridge to the right toward Mt Elijah with views in all directions. 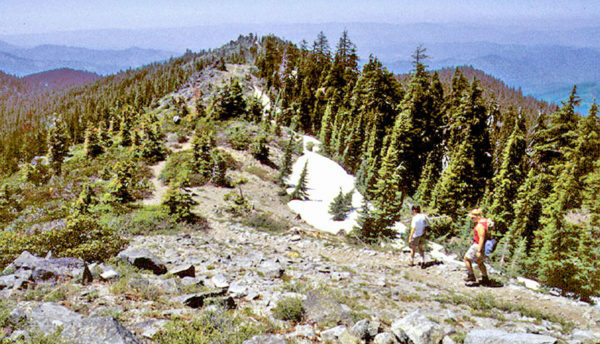 Watch for Mount Shasta on the left. Advisory to horse riders – horses may have difficulty going down the steep, rocky section on the west side of Mt Elijah. There is a bypass trail below and on the Bigelow Lakes side of the peak that circumvents this section of the trail. Watch for this on the right after passing the two trail intersections at the saddle. The trail descends from Mt Elijah along a rocky ridge toward Oregon Caves. From Mt Elijah, the trail descends down a rocky ridge composed of diorite granite with rock outcrops and sparse tree cover. The trail enters a deeper forest a short way down the ridge and after entering this an unmarked trail will be seen going down to the left. This goes to a Forest Service Road about half a mile away. Continue straight ahead at this intersection. About a mile from the peak, watch carefully on the right for the narrow trail that will take you back to the parking area. This trail is somewhat hidden behind brush and at the time of this writing was not well marked. It connects you to the abandoned road that takes you back to the parking area. 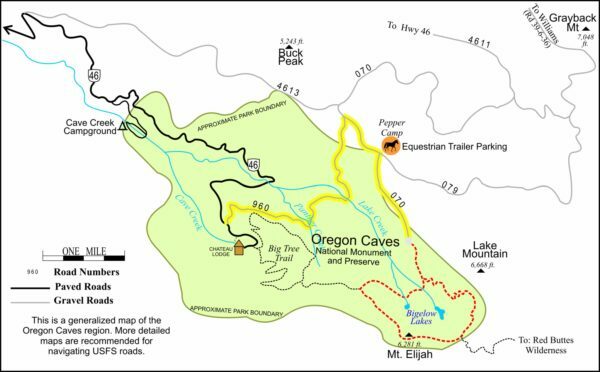 Note to people visiting Oregon Caves or staying in the Oregon Caves Chateau – If you can talk someone into driving you up and dropping you off at the Bigelow Lakes trailhead, you can hike down to Oregon Caves by continuing straight ahead at the last intersection. The trail to the monument connects with the Big Tree Loop Trail. 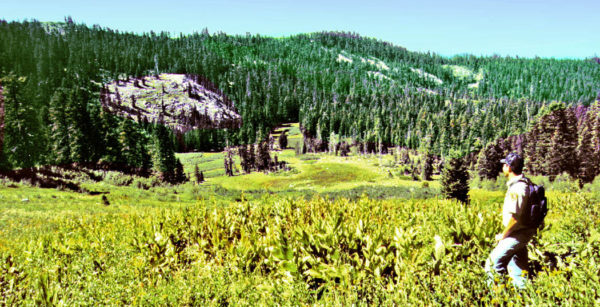 You have the option of going to the right to see the Big Tree or to the left through a meadow and scenic forest to the park’s historic district.